First introduced in 1955 (the same year as the iconic .44 Magnum), the Python .357 was a premium firearm that many collectors now consider to be the finest production revolver ever made. The Python is a double-action handgun using a .357 caliber Magnum round in a six-shot cylinder and is built on the *huge* I-Frame platform. It has a reputation for accuracy, incredibly smooth trigger pull and very tight lock-up when the cylinder is seated in the home position. Released as the top-of-the-line model, it was originally intended for use as a large "38 special" target revolver and thus was given many features such as adjustable sights, a solid, full-barrel underlug and ventilated top rib. The BrickGun Python .357 continues the tradition of not only our own models, but of the real-life Python as well. The real Python was packed with features and we worked for almost a year to incorporate as many as we could into our first revolver. This led us to complete not only a spinning cylinder, but one which could unlock and "fly" out. This, in addition to finding room for a working hammer and trigger, is a design we are incredibly proud of. Packing that much functionality into such a limited space was perhaps the greatest design challenge we have answered to date. Luckily, the Python .357 is a *huge* weapon (it's only a fraction smaller than our Desert Eagle! ), which made it a bit easier to pack in the features. It's ten inches long and feels *great* in the hand, being truly life-sized, it is an honest to goodness "hand cannon". The spin of the cylinder, cocking of the hammer and solid "click" of the trigger are fantastic. It definitely has that "old school" vibe and reflects perfectly the iconic style from the heyday of 6-shot revolvers. Our fans had requested a revolver from us for years, and we've answered that call. So grab a BrickGun Python .357 today! PLEASE NOTE: Due to the complexity of this model it is recommended for very experienced builders only. 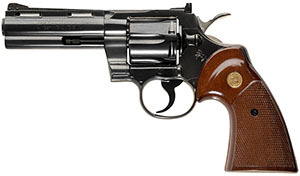 While we have made every attempt to make the Python .357 sturdy, it is a model and is not intended for rough play. 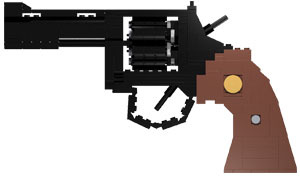 BrickGun kits include everything you need to build your own model. We supply all the pieces necessary, along with a link to download easy-to-follow instructions which walk you through every step of the build process. The models are simple, yet intricately detailed and can typically be put together in under an hour. All mechanics are actuated by rubber bands supplied with the kit. BrickGun also offers .pdf versions of our instruction pages. If you already have the pieces necessary to build the model you can purchase a download of the instructions and view them digitally or print them using Adobe's free Acrobat Reader. Thousands of BrickGun models have been sold around the world for over a decade with 100% satisfaction. All transactions are handled securely via paypal and units typically arrive within 2 weeks of purchase. We deliver a quality product that we love to make and sell. That's what makes them the coolest plastic building brick weapons in the world! If you have any questions, please email The BrickGun Team. 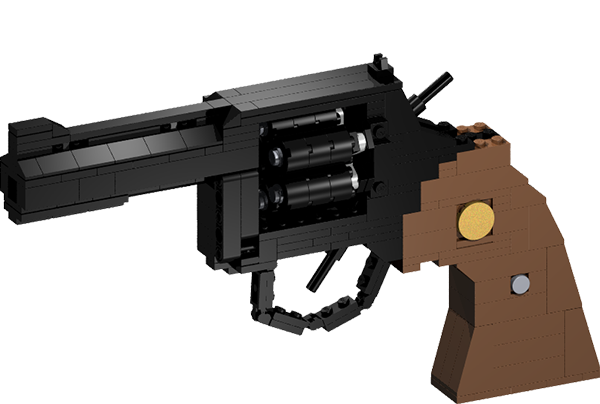 ATTENTION: BrickGun models DO NOT FIRE PROJECTILES and are not actual working weapons, they are plastic building brick models meant only to display the form and mechanical functions of real guns. BrickGun Rubber Band kits DO FIRE RUBBER BANDS and caution must be exercised at all times while building, viewing and playing with the model. Never point BrickGun Rubber Band models at yourself, other people or pets. Extra care should be exercised when loading rubber bands into the models. By building (either partially or completely) any BrickGun model (regular or Rubber Band) you release BrickGun and all of its employees from liability for any injury or damages done to persons or property due to its use or misuse.